With all my Heart (Mixi Heart): Inspiration? I am doing pretty good on my list. I checked off quilting my new pattern "BackPacking". Yay!! All I need to do is bind these two little babies!!... and no binding wasn't a separate item I just need to do that. Here is the BackPacking Wall Hanging. I also have a table runner or what I like to call a "Skinny". It can be a wall hanging as well and hopefully I will be able to share how that works in my house over the next few days. Here they are side-by-side. 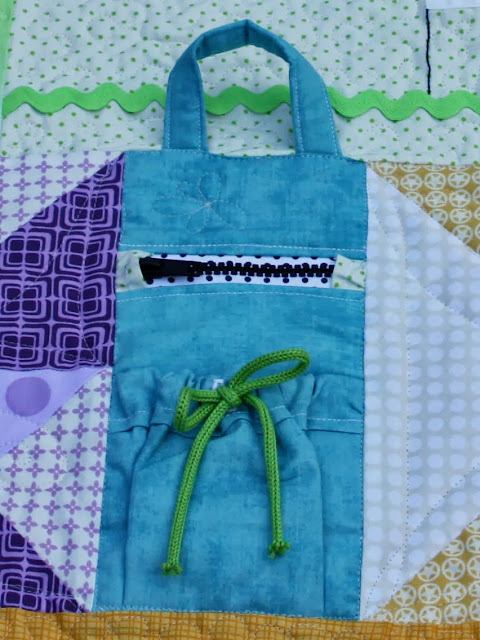 It is one pattern but you are able to use different layout arrangements to achieve the size you desire. I hope to release this pattern asap. 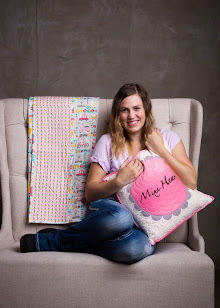 I am taking it with me to Quilt Market so tell your local quilt store to look for Mixi Heart and how she is a cute girl that loves quilting! 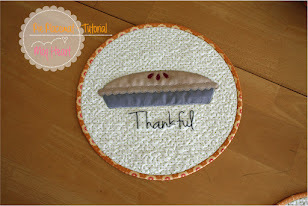 I will update this blog when I have the pattern written and for sale in my pattern shop. 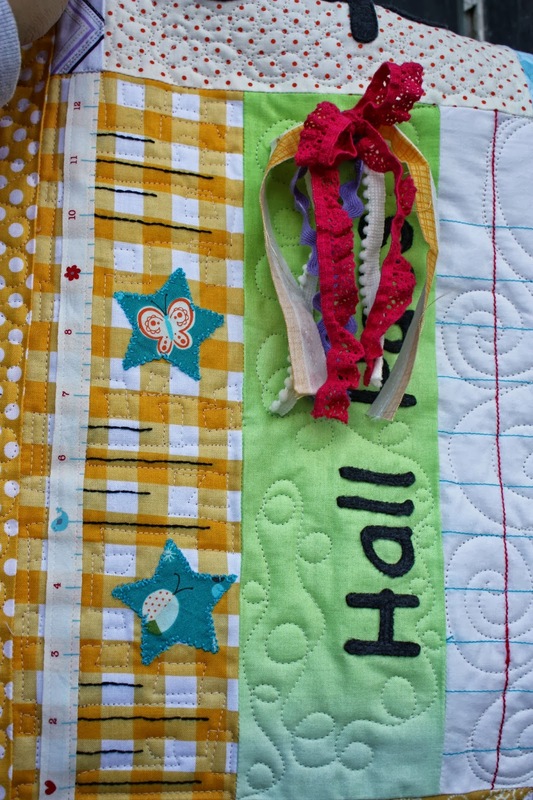 There is a sheet of paper in the pattern - I was able to have my kids write their names and draw a bit with a soluble marker, then embroider over the tracings. 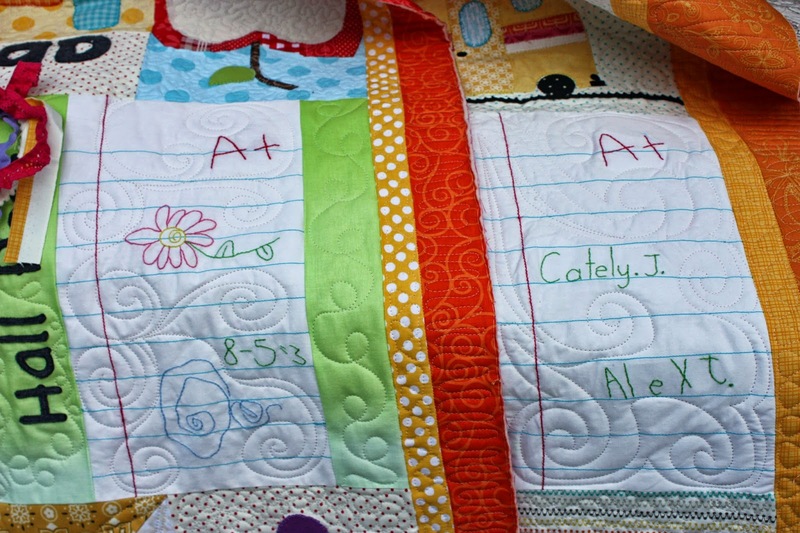 This is a great way to customize your quilt! I love when things are unique so it was a neat thing to include. 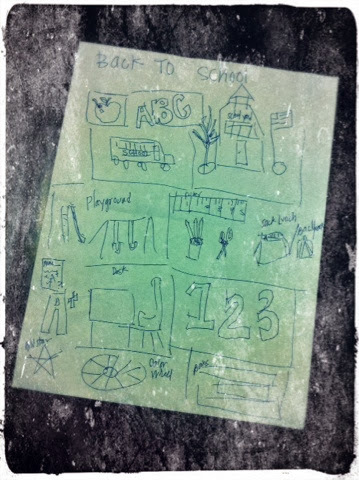 (PS - my little guy LOVES math so it is not surprising that he included a math problem although a little humorous and my sweet girl is an amazing little artist, don't mind me while I talk up my kids). 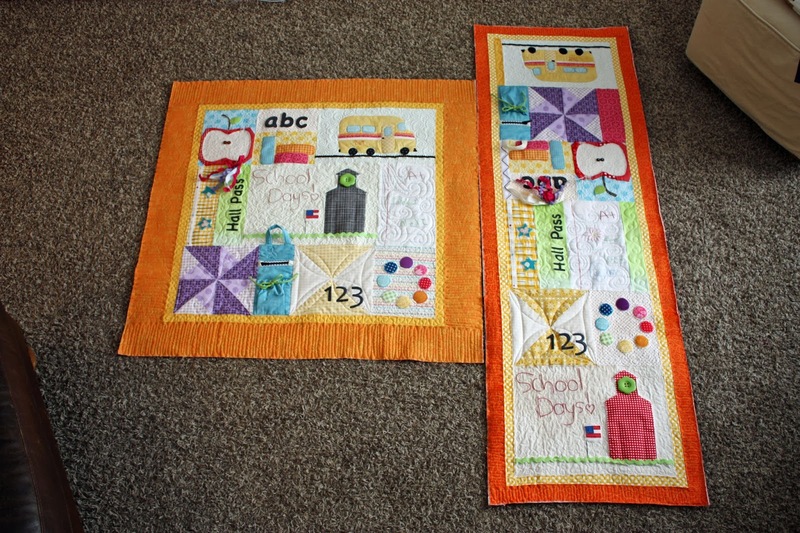 It is a little tuff to see in the pic but for the abc block I quilted with a fun easy background quilting. It is just a mess of circles. It was super easy and fast and cute for this quilt. 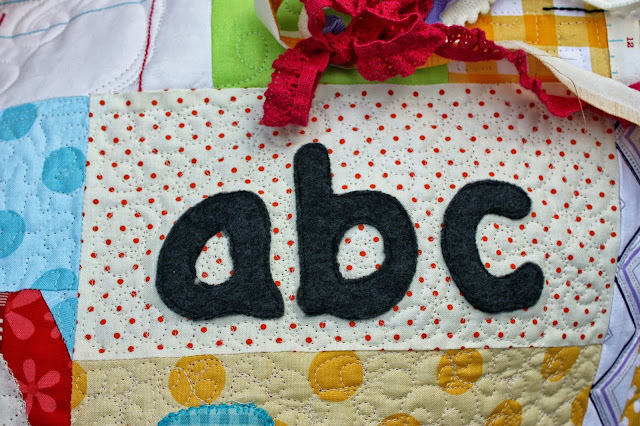 Plus it really helps the fleece letter appliqué just stand right out dimensionally. It is definitely something one should try at home. 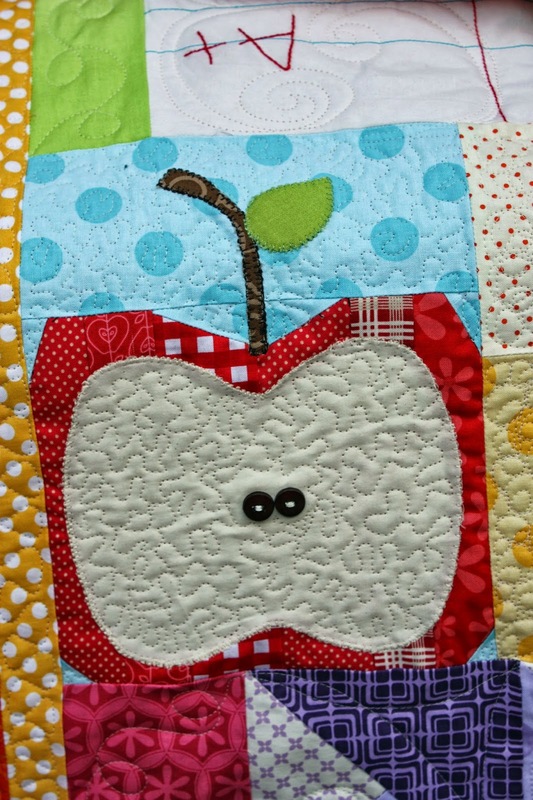 Here is the finished apple block I shared awhile ago with my tooth post. 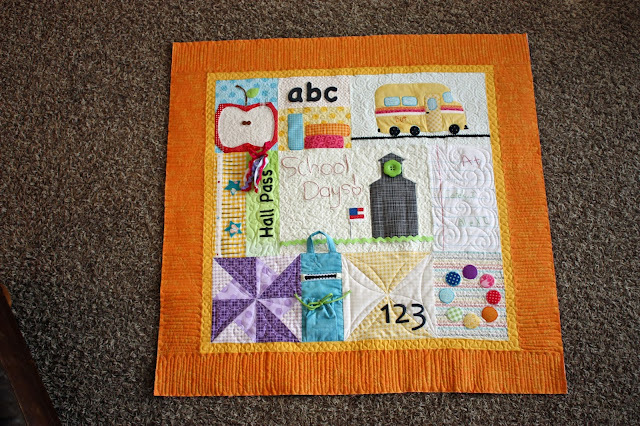 Can't have a school quilt without an apple. AND most importantly a BACKPACK! It includes 2 pockets that are functional. I was thinking about what I wanted to put in the pocket and I was thinking maybe lunch money?? It might make the quilt worth more! 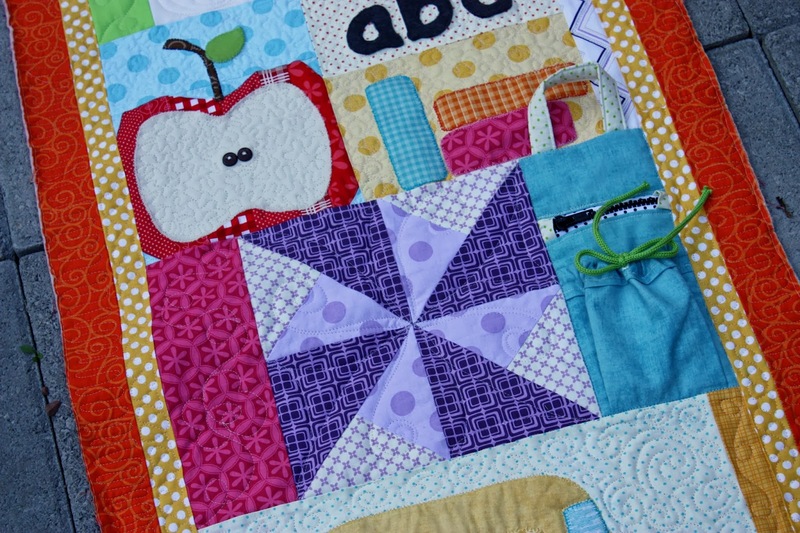 The block includes a zipper but could easy be left out. It was a great chance to use those zipper skills though or learn for the first time for some. Take note that on one of the backpacks there is a cute flower :) Must be a girl backpack. I love the pieced blocks in this quilt. One is just a fun turnstile with my most favorite color and then the other is an hourglass that happens to be my Quilting Guild Challenge Block for our Christmas Challenge (killing two poor little birds with one stone). I also loved quilting the ruler block. 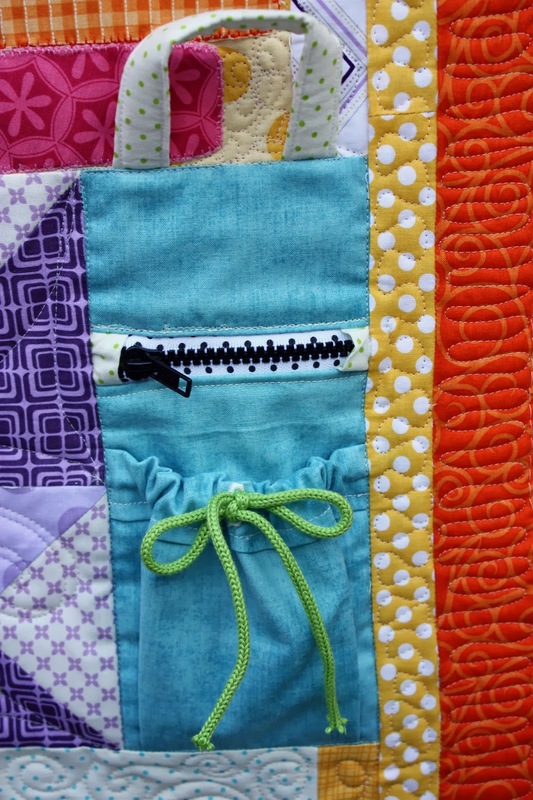 In both quilts I did a square path. 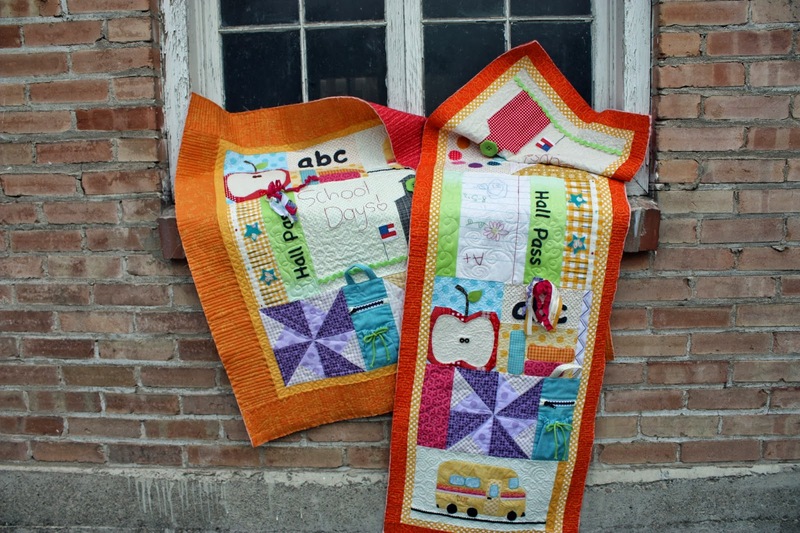 What I enjoy about the sampler style quilts is the range of quilting designs you can just try on a small scale. I know I have mentioned this before but it is so much fun to try something I haven't tried (which is a lot by the way being the new long armer that I am). You can kinda see the crazy circle design above a little bit better. You only have to make it work for a small area. Plus it is just background so it isn't as noticeable if you "make a mistake". 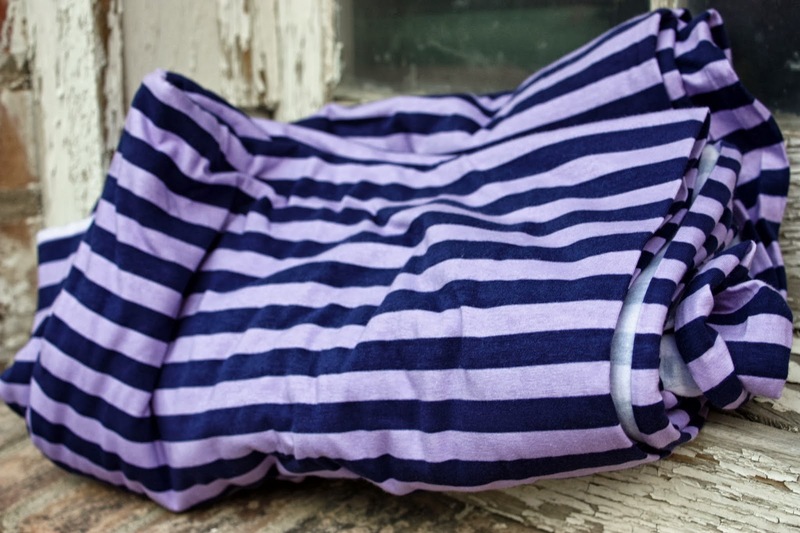 Next item on the agenda is my Mixi Skirt pattern made out of this fabric. I love the colors! They couldn't be more perfect and I can't wait to wear my skirt in Houston. Wish me luck on the skirt. Speaking of Inspiration... I need some inspiration for my decorations. I think that I have a couple great ideas, though I try to never stop that process for sake of a wonderful epiphany. AND one more thing I found inspirational - "PERFECT = BORING"
Everything looks so good for Houston I bet you will rock it there! I love the stuff from your kids you put on the quilts. So so cute and what a good idea.